anyone know what species of aquatic oligochaeta live in north carolina? i have collected about half a pound of some out of a pond in carthage. dont worry, i own the pond. im thinking about letting the pond stay fish free. it can produce a lot of worms... if i can get my harvesting methods down, i could probably harvest a few pounds out of it a day. ill have pics and videos soon(upload i slow where im at). the worms get longer than california black worms, and seem to be more thin in general. videos will have to wait on the horrendously slow upload. I have collected annelids similar to black and tubifex worms from sediments in local pond and swamps here in New York State. Being sure of their identity is difficult. They could be Tubifex worms. "Telling blackworms from tubifex. You may want to confirm that your worms are Lumbriculus. Blackworms swim; tubifex don't. If you gently touch a blackworm's front end, it can flip in half a second and reverse direction. A gentle poke at the rear end will send a blackworm agilely swimming away. Dr Charles Drewes' article "Helical swimming and body reversal behaviors in Lumbriculus" gives you the details of this characteristic blackworm behavior. Tubifex don't have an escape response like this." But they sure look like common blackworms to me. Glad to have you back in NC! You should keep some in a small container and see how long it takes for them to reproduce enough to double the colony size. People seem to have a hard time culturing black worms, but I'd like to try. If these reproduce well, I think they will be the ticket. so, for some reason photobucket did not work. so i tried uploading a video to youtube. well, it worked. this is a video of me explaining where the worms come from. my lovely assistant was with me (my daughter, gabby). she said we need to go fishing... well, we never did make it out to a creek to fish, but she had a lot of fun at a house warming party we had the next day. Edited by Auban, 19 January 2015 - 08:19 PM. i think ill just satisfy myself with Lumbriculus(which im pretty sure of). eventually, i would love to know the species. but, in the end, it doesnt really matter. That is way cool. I will definitely have to start checking out mats of algae whenever I can find them. video of the first harvesting method i tried. not the greatest method, but it works well enough i guess. there are a LOT of worms in those floating mats. Try putting a bunch of that stuff in a dip net and hanging it over a container with just the very bottom touching the water, they will likely follow the moisture as it drains/dries. How about laying the algae mat on top of (or under???) several layers of fiberglass window screen? The blackworms may be more willing to leave the algae if they have some alternative medium to crawl into. Try bunching up the screening into a tight ball, then open it up so it's wrinkled and the layers dont lay completely flat against each other. How about this...If you were able to get your hands on some floating bead filter media, or even the styro stuffing from a bean bag you could do what Gerald is suggesting, but, put the floating media under a "basket" made with the screening or fine mesh, let the worms migrate into it, then remove the "basket" causing the media to float and the worms to sink. 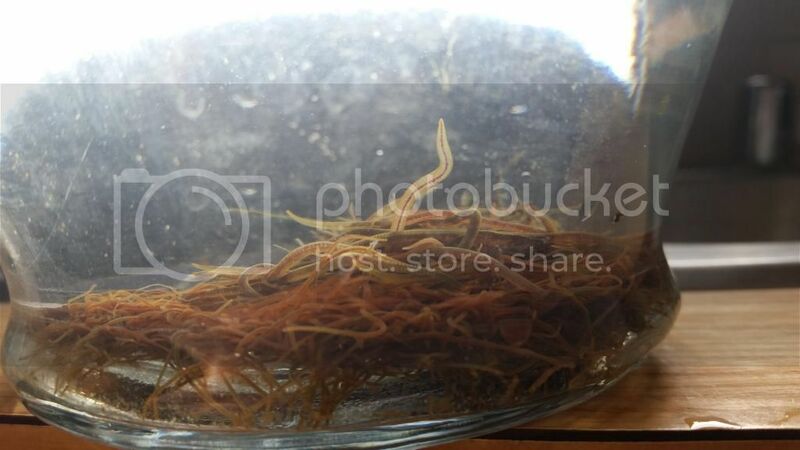 set the algae/hair grass mat in a mesh bag and put it in a ta k tank with cool water. prepare another tank with very warm water(ill have to find out what the worms can tolerate) and basically just take the mesh bag and move it from the cold tank to the warm tank, causing all the worms to scatter. then just set it back in the cool tank, let the remaining worms settle down and crawl around a bit, and do it again. no need to keep siphoning the worms off over and over to keep them from going back to the mat, i can just leave them until it seems the mat no longer produces. i have found that all the worms will travel back to the mat if i leave them too long... and im not very keen on offering them another medium to tangle themselves up into. i want to find a way to make it pretty darn easy and as hassle free as possible. 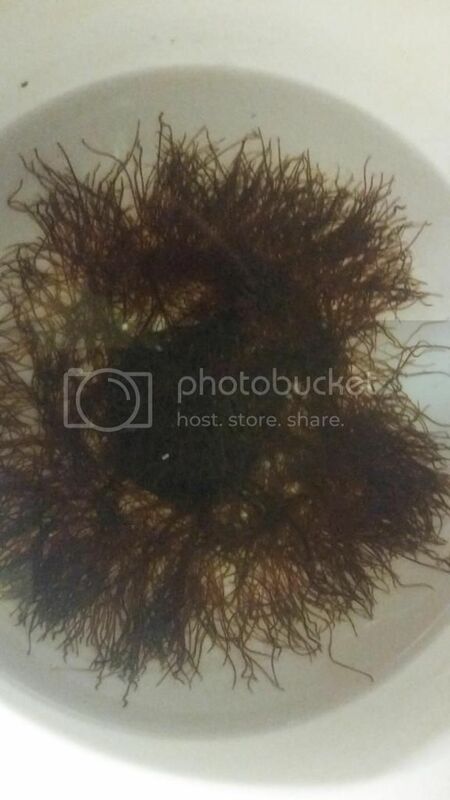 i have long known that i can easily culture black worms in algae. the problem has always been extracting them from the algae. with a free source of unlimited black worms, i finally decided it was worth my effort to find out how to harvest them. Edited by Auban, 20 January 2015 - 06:47 PM. I wonder how and why that pond has remained fish-free? Not many landowners want a fish-free pond, and the few that do are probably all reading this thread. Did the seller have anything to say about the pond? Maybe it was dosed heavy with copper sulfate years ago? What else have you found living in it? Daphnia? Fairy shrimp? Tiger salamanders? Are you back in Raeford or somewhere else now? im in carthage, and i actually live next door to the guy whos family built the barns on the property. ill have to ask about it. they were horse people, so they probably never cared about fish. so far, the only thing i have found in it are crayfish, tadpoles, dragonfly larvae, and various other insects you would expect to find in a fishless pond. i havent really explored it yet. i havent checked for daphnia, but it DOES have some of the largest freshwater copepods i have ever seen. I'm pretty sure Scott's suggestion for efficient collection is an excellent one. Don't dismiss it by association with the other ideas. the biggest issue i have with it is that it involves leaving the plant mass out of the water. it DOES work, but not very well. a lot of worms will simply curl up inside of it as they dry out. its only the ones that are close to the water line that will actually come out. so, i think the most efficient means of collecting them will be one that spurs the worms into motion while making sure they have enough water present to actually move. i could to that with something to spray water on the algae/plant mat while the worms crawl out, but thats getting complicated and i want to test out the simplest ideas first. im a big fan of fast and simple. Edited by Auban, 24 January 2015 - 11:53 AM. I think this is the idea Scott had that gzeiger is referring to. "How about this...If you were able to get your hands on some floating bead filter media, or even the styro stuffing from a bean bag you could do what Gerald is suggesting, but, put the floating media under a "basket" made with the screening or fine mesh, let the worms migrate into it, then remove the "basket" causing the media to float and the worms to sink." It sounds really good to me. Simple and very clean. Assuming the worms climb into the basket of floating balls. If they do you could build several of these baskets and have virtually no sorting. Once you released the balls, the worms would fall to the bottom of the container and you could dipnet the balls out. If the worms do not climb into the balls, maybe they would at night. You could even break up regular styrofoam into the tiny balls that it is composed of. Very neat resource, it sounds like you could make some money with it. The Raleigh Aquar Soc has been buying about 10 lbs a month, at $15-20 a pound ... we'd love to get them from you!